I don't know if this is an issue if anyone has noticed but lately, where I live, grocery stores no longer sell yellow bananas! Their entire stock is green and green ones taste bitter. Is it the weather ? Supply and demand ? A new strategy ? Let’s me connect this with hiring strategy of most of the companies…. If you've been hiring, you may have noticed the exact same thing happening with salespeople! There aren't many ripe sales people but there seem to be plenty of green ones. When you assessed, screened and interviewed a salesperson and you say to yourself, "This is exactly what we are looking for - SWEET!" That would be yellow. Green would represent either lack of sales experience or competency mismatch in the desired selling environment. The situation becomes more worst when it comes to hiring in Niche sector where the demand & supply gap is quite wide. a)Only hiring experienced professional may not bring the innovation to the sales environment since a preconceived notion kills “ Out of Box” thinking. Further more it’s difficult to Unlearn. b)By sticking to select only experienced sales professionals, companies are loosing out on fresh young minds with “ fire in belly” attitude ,they surly can be assets in long run. You just need right handholding, adequate training and of course some patience till they start firing. They aren’t many experienced sales professional specifically in the niche business segment hence same set of professionals are just rotating regularly, hiring floating professional certainly can’t guarantee the longevity and generating continuous profits. It’s high time that “Competency based evaluation process, Cultural fitment, Structured interview process, inclusion of different assessment tests should be given higher weightage while selecting thus promoting fresh talent. 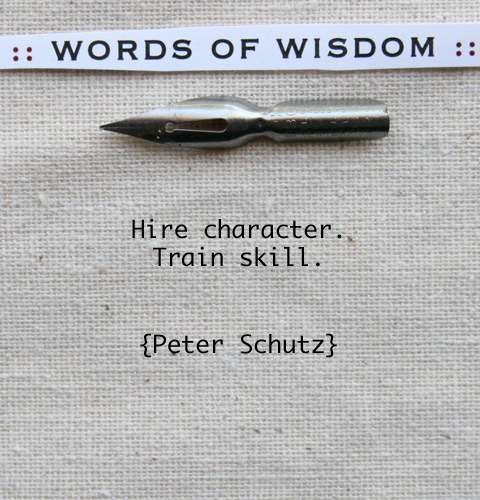 Hire Characters, Train Skills ….